Wanda Lee Rohlfs of Main Street Lincoln looks on as Ron Keller, Lincoln Heritage Museum director at Lincoln College (left), and Paul Beaver, Lincoln College history professor emeritus, unveil a new painting for Logan County. 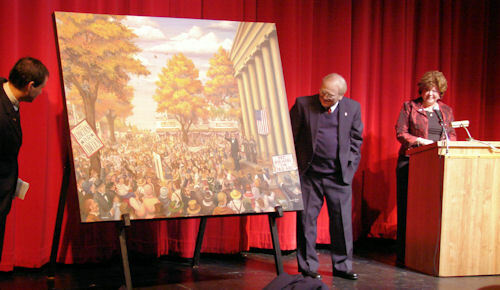 The painting depicts the rally on Oct. 16, 1858, when Abraham Lincoln stood on the steps of the Logan County Courthouse before a large crowd of 5,000. 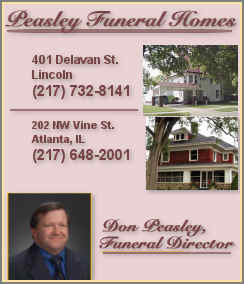 Lincoln was in a hotly contested run for the Illinois U.S. Senate seat against Steven A. Douglas. 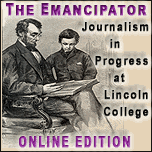 Lincoln won Logan County, lost Sangamon County and lost that race, but then became the next U.S. president. Click here to read more details about this painting and other bicentennial projects. Editorial: As times get hard, what will we do? Zooming in on the people, places and things that make this community interesting! Donations to the Simonson Family Fire Fund should be sent to State Bank of Lincoln at 508 Broadway, or they can be dropped off at any State Bank location. Euro zone inflation drops to 1.1 percent in Jan.